This is a Japanese WW2 wreck lying in front of what is now the Bimoli cooking oil factory. It was at anchor carrying munitions when it was blown up by torpedoes launched by an attacking US submarine (the USS Swordfish), causing the munitions to blow the aft end completely apart, which now is a pile of plating on the deep end of the wreck. The ship lies leaning to one side with the bottom at 32 metres and the highest point on the wreck about 12 metres in depth. Schools of large Barracuda can be seen at times as well as Potato Cod in the hold, White tip reef Sharks dozing beneath and passing Eagle Rays. 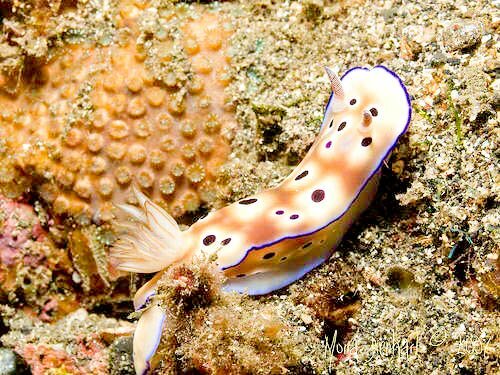 The sponge gardens below the bow and to the starboard side present excellent Nudibranch and other critter possibilities. Visibility here is usually much better than at wrecks further up the strait, though wavy conditions can limit diving here during the height of the June-September SE winds. Having ength for about 60m, this Japanese World War II wreck lying on its starboard side in 100' of water. It suffered major damage when it was hit by torpedo. The twisted wreckage is heavily overgrown and great for exploring. A giant lobster usually puts in an appearance and a school of giant Barracuda circle the ship.